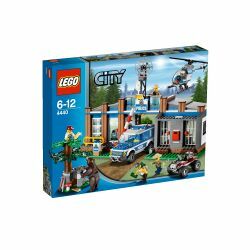 4440 Forest Police Station is a City Forest set released in 2012. It contains five minifigures. This is a description taken from LEGO.com. Please do not modify it. (visit this item's product page) Be on the guard for robbers at the Forest Police Station! From the Forest Police Station, the forest policemen spot the robbers hiding the stolen goods behind a rock. Can they catch the robbers with the helicopter and keep them locked up in the cell? Will the bear chase them up the tree and foil their escape? You decide! Includes 5 minifigures: 2 forest policemen, 2 robbers and a pilot. Move the rocks to reveal the stolen goods! Remove the mailbox and escape! Watch out for the bear and catch the robbers! The base of the police station has new moulded "brick" pieces. This is one of only two sets that will include the bear figure as well as 4442 Bandit's Hideout Cabin. The 4WD has an opening boot which fits a money bag and a suitcase. This set is featured in The LEGO® Story. Facts about "4440 Forest Police Station"
Be on the guard for robbers at the Forest Police Station! This page was last edited on 9 February 2019, at 18:42.